As a football/powerlifting coach if it hurts my athletes being athletes I don't allow them to do it. I try to use powerliftng as a tool to help build stronger, bigger and more explosive athletes. I also research all the time with better strength and conditioning practices. Five years ago I came across Triphasic Training by Cal Dietz who is probably is the best college strength coach in the country. If you want your athletic program to get better you should take two four week blocks out of the year and run a two week Eccentric Phase and a two week Isometric Phase. Now Triphasic training is suppose to increase muscle density ie less pulled muscles and also give athletes more potential for change of direction and explosiveness. But the data I am going to share is strictly having to do with the sport of powerlifting and how much more strength was gained in less than a week of eccentric training. The Workout was 8 set of 2 @ 80% of raw max with a 5 second eccentric descend. We use Safety Bar Squats and Bench Press on Monday on Tuesday we used Hex Bar Deadlifts and Meadows Rows. Here are the results of the Girls Meets with just one week of eccentric training. As you can see the strength gains are incredible like I said that is only one many things that Triphasic can do for your program. How to put yourself in the best possible position to earn an football scholarship. Jim Wendler's 5-3-1 is a great program to use. There are 4 core lifts Overhead Press, Deadlift, Bench Press, and Squat. I would replace Overhead Press with Push Press and Deadlift with Powerclean. I am not going to share Jim's Percentages you will have to buy the book. Each core lift is done once a week and the last set is a rep max. The great thing about 5-3-1 is that the goal is to increase 5lbs every cycle for upper body and Olympic lifts and 10lbs for lower body lifts. These gains don't seem like a lot, but lets run the numbers. 7th grader Bench 65lb and 95lb squat max November. 8th grader Bench 125lb and 215lb squat max November. 9th grader Bench 185lb and 335lb squat max November. Sophmore Bench 245lb and 455lb squat max November. Junior Bench 305lb and 575lb squat max November. Now mind you that the athlete totally buys in and does summer strength and conditioning and barring injury. As a football coach it worries me that my 6 year old son might not have the opportunity to play this great game of football. Football is under attack it is a real problem that us as football coaches need to change our philosophy of practice planning, the way we teach tackling, and use some of the new technological innovations that have been developed. John Gagliardi had some innovatie ideas and with 30 conference championships, four national titles and a record 485 wins. You cannot argue with his success and his unique approach I as a coach wish he was still coaching would really enjoy going up there and see exactly how they practice. My last job offense coordinator job our JV would not give us a good look in practice. We would scorch the earth on Monday, Tuesday, and Wednesday and have trouble on Friday Night Games. So we worked our Zones without the JV half line vs, the other side starting offensive line and they gave us great looks since we two platooned(and offensive line men in their heart of hearts think they are first big skill guys then next defensive linemen). We would work all of our 3 step, Quick Screens and 5 step pass vs our starting defense with a quick whistle. We would run or Power Schemes and slow screens vs our JV and towards the end of the season our Varsity. I believe offensively the chances of a concussion can almost eliminated completely by the way you sent up your practice schedule and run your practice. Now defensively is where a lot of changes must be made. By its nature defense must use more team and inside so the linebackers and safeties can make their run fits. The Seattle Seahawks and Pete Carroll have implemented the Rugby style of tackling. Where the head is totally taken away from the tackle. It changes the across the bow tackling that coaches have been emphasizing from the 1920's to if you are an force player you are still going to use your inside arm and shoulder to tackle the ball carrier and if your are a leverage player you are going to use your outside arm and shoulder to make the tackle. We have to remember as coaches the if we don't change and regulate ourselves as coaches we may-not have a sport left. Football is one of the last developers of men that exist in our society we can protect it and preserve the total institution or keep on doing the same things lose this great sport then what will happen to the Michael Orr's of this world. Watch live Glazier Clinics Webinars free during the month of June. With a Glazier Clinics Season Pass, you have immediate access to watch over 250+ archived Glazier Clinics Webinars on-demand. Head Coach Academy provides free, live webinars to train head coaches in every sport to be great CEOs of their programs. If you're a head coach or an aspiring head coach, we're here to equip you! Use the links below to sign up for any or all of these upcoming sessions. Missed a webinar? Click here to watch past webinars on-demand. For a limited time, we are only allowing coaches on our email list to view past webinars. This means you will not find this special link to the archives anywhere on our website. This first thing about changing a teams culture in the off-season is that there is no off-season! They are competing with their teammates, opponents, athletes across the state and even country for playing time, accolades, and scholarships. The school I am currently had a strength coaching for the 2013-2014 school year and he was very successful working will all sports. If the athletes followed the program than they would get bigger, faster, stronger, and would move better. The problem was buy-in we had several athletes skip the athletic period we would run them make them sore but no real buy in. We broke them up into 4 teams with 2 captains for each team. We had to develop some leadership from those guys we were going to count on for the coming up season. Then we had a Draft where each team would pick every person in offseason. o -30 points for excused absences with a call or email. o Bonus points given by coaches for being seen, putting out effort, doing extra. Average strength increase for the football team across the three core lifts from Thanksgiving break to February 1st. 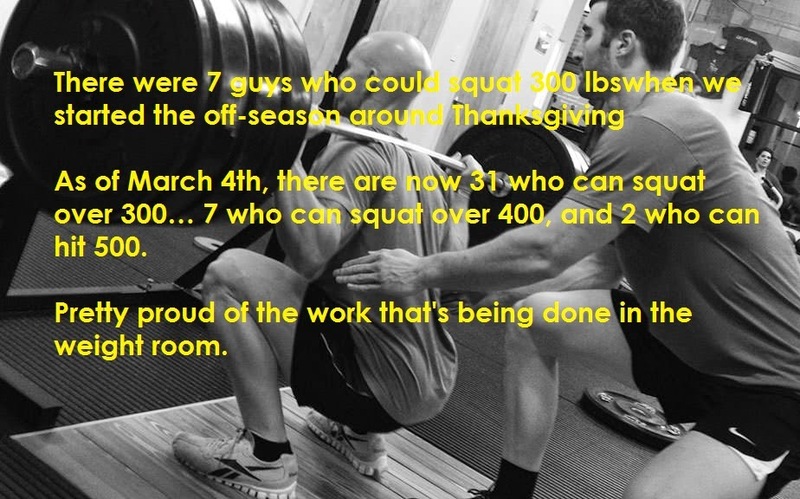 Average strength increases in pounds based on attending after school workouts from Thanksgiving break to February 1st. At the start of the offseason, 19 athletes had a standing broad jump over 7 feet 5 inches. At the start of the offseason, 17 athletes ran the 5-10-5 in under 4.72 (Nike Sparq National Average). Now there are 29, with 14 posting marks under 4.49 seconds.